These have a cool kinda "Spinner" on them. Lots of animation and I think a very universal color. I hope you like them! Nice cursor set! Animations are smooth and non-intrusive, colors are great with my current theme (longhorn). YEAAH HAAAA, now we're talking radial!!! Gosh, Thank you, you guys are too much. I really appreciate your comments. I have much respect for you guys so it means everything to me for you to send your comments. Thank you. Oh no, no way, I don't do that. I mean that it means a lot to me for you guys to take the time to send your comments. I've been seeing all this artwork for a long time and you guys putting stuff on the web and it took me a long time to get the nerve to do it. I'm new to this graphic arts thing so I just feel lucky when something looks ok. I'm sorry if I sounded sarcastic, I just got up and I was really excited to see the comments, I meant that with the upmost of respect, no sarcasm was meant at all. I say again, Thank you guys very much. Very nice Radial .Hope to see more from ya. Very Sharp!!! Great job on these Radial_FX. I love these! You did such a great job! They are so cute! (I hope that's okay to say)! A definite ten! dude, excellent work. just a little suggestion if you can make the tip spin instead of the little wheel at the base would make it even better. Thanks for sharing your nice cursors. Thank you guys very much! And werewolf you are right, they go great with your Longhorn skin, which by the way is a great skin and one I keep on my system and use! 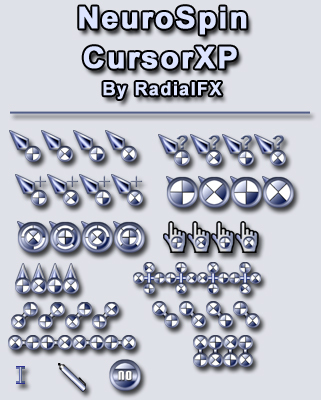 This is a really nice cursor set. It is very comfortable to work with and looks good with color changes. The animations are slick and not distracting. It is creative, practical, and attractive. Thanks. Great graphics. So smooth. Love em! Brill !! one o' da best I've seen yet ! I thought I would use this cursor for a little while before commenting, and I must say, it really is VERY nice indeed. The animations are excellent and it goes real well with a few of my WB skins! Thanks for making this. Thank all of you very much. BoXXi, you've got some great skins that anybodys cursors would be happy to share desktop space with. You do really great work and I have admired it for quite some time. Thank you for your comments.